Hydro = water. Kinetics = motion. Hydrokinetics = the motion of water. Hydrokinetic energy = energy from the motion of water. The ocean is the biggest solar system in the world, transforming surface heat into deeper cold. It translates the planetary force of the moon into tides. And it is the biggest wind energy system in the world, transforming winds into waves. The mechanical force of waves can be captured and transformed into electricity, as can the mechanical force of the tides and the temperature differential between the ocean surface and the ocean’s depths. Nevertheless, there are fewer than 12 megawatts of installed ocean energy capacity in the world. 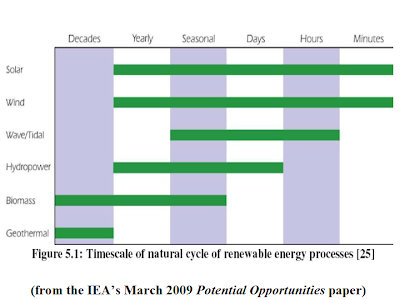 A series of reports to the the International Energy Agency (IEA) in the first half of 2009 summarize the state of Ocean Energy Systems (OES) development worldwide. 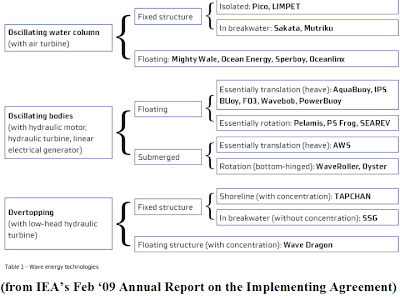 The reports include (2) The International Energy Agency Implementing Agreement on Ocean Energy Systems 2008 Annual Report, (2) Ocean Energy: Global Technology Development Status, (3) Potential opportunities and differences associated with integration of ocean wave and marine current energy plants, in comparison to wind energy and (4) Key features and identification of improvement needs to the existing relevant interconnection guidelines for facilitating integration of ocean energy pilot projects. Worldwide research and development of ocean energies is expected to reach $2 billion over the next 3 years, driving the installation of prototypes and pilot projects around the world. Tidal energies are present at coastlines around the world and considered highly accessible for energy capture. The turbines to harvest tidal energy are frequently described as very like wind turbines placed in any strong tidal flow. 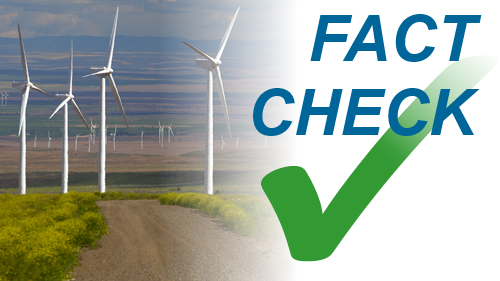 The only obstacle to success so far has been turbine sturdiness. Because the flow of water is calculated to be 800 times denser than the flow of wind, ocean and tidal energy turbines have to be heavier and more expensive but can capture more energy for the effort and cost. Wave energy is even more widespread than tidal energy and represents even greater potential. On the energy-rich Pacific Northwest coast of the U.S., waves could generate 40–70 kilowatts (kW) of electricity per meter (3.3 feet) of coastline. Worldwide, analysts believe there is enough wave energy to generate 2 terawatts (2 trillion watts) of electricity. 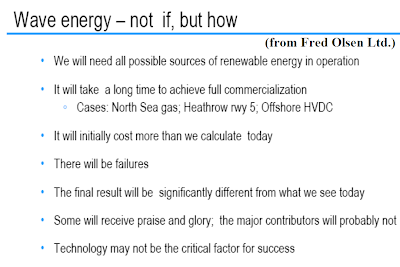 The biggest obstacle, at present, to wave energy development is its many, many competitive technologies. Without a single agreed-on technology (like wind energy’s 3-blade turbine) or technologies (like the solar industry’s few competing versions of solar panels and its handful of competing solar power plant designs), there can be no directed incentives, no production technologies at utility scale, no volume to bring costs down. Right now, the best UK wave energy technology in place is producing power at something like 6.7 cents per kilowatt-hour. 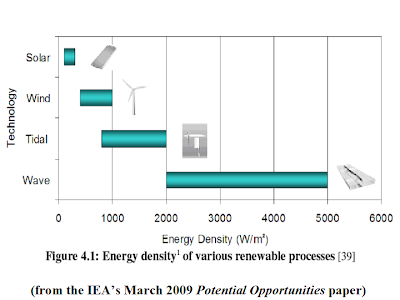 Settling on a set of technologies, moving them toward efficient performance and building them in commercial quantities to develop economies of scale would, it is estimated, bring the cost of wave energy-generated electricity down near the cost of wind power-generated electricity, ~4.5 cents per kilowatt-hour. Big coal plants, already built and operating on the expense basis of the last generation of energy sources, produce electricity at ~2.6 cents per kilowatt-hour (according to some estimates). 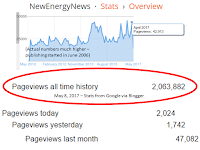 New coal plants cannot be built at costs allowing for electricity to be generated that cheaply and few new coal plants are, in fact, being licensed in industrial nations because governments are holding off in the empty hope of a breakthrough in “clean” coal technology. 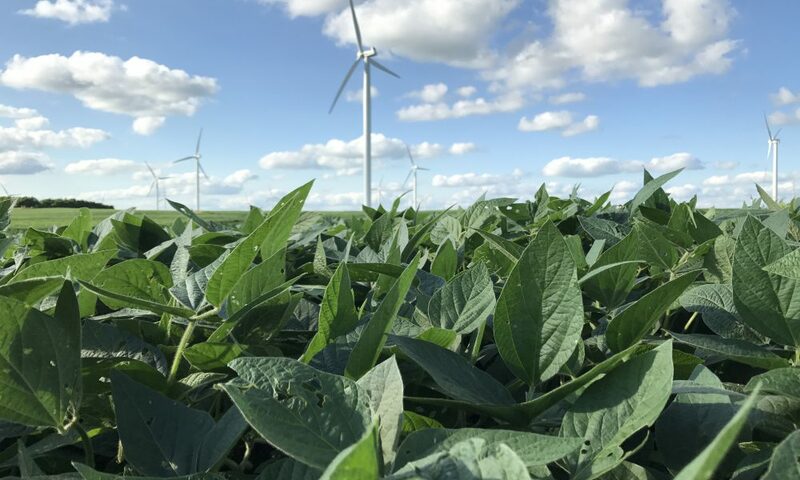 New natural gas plants, the biggest source of new power generation in the U.S. and most developed countries, can get costs down to ~3 cents per kilowatt hour but it is usually closer to 5 cents per kilowatt-hour and higher. And the cost of electricity from both coal and natural gas will rise as the price on greenhouse gas emissions rises, as it inevitably will when society begins charging fossil fuels for the harm they do. 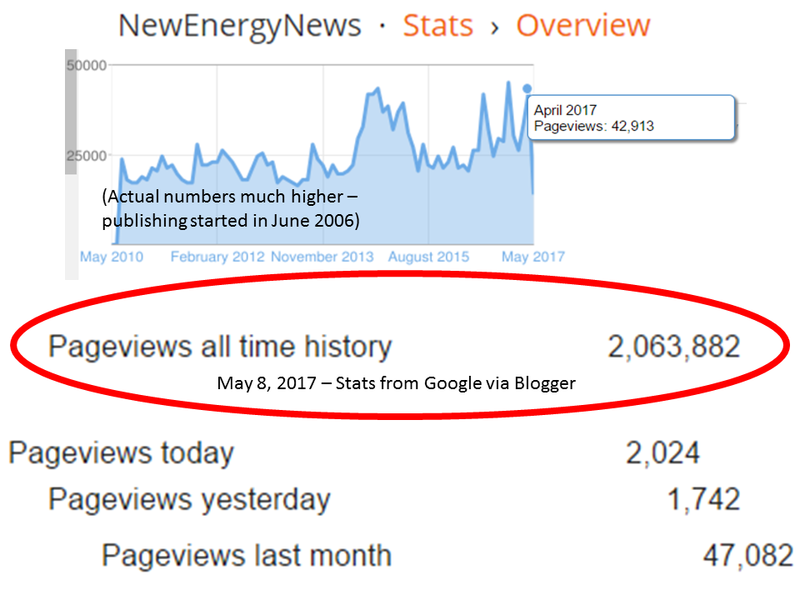 That is why there is so much interest in the New Energies in general and in the hydrokinetic energies in particular. The U.S., Brazil, Scotland, Germany, Portugal, Canada and France are all aggressively developing wave energy projects. The expectation is of 30+% growth over the next 5 years. 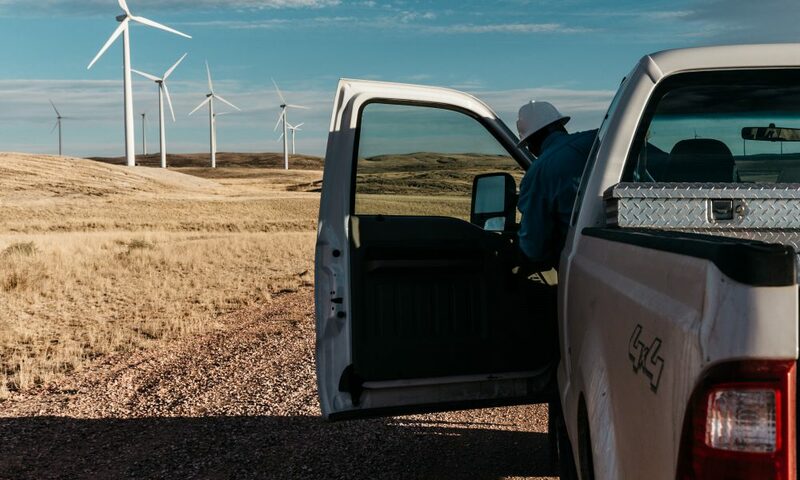 The U.S. Department of Energy (DOE) recently awarded $18+ million in grants for Advanced Water Power Projects in 3 categories, (1) Technology Development, (2) Market Acceleration and (3) National Marine Energy Centers. This significant public investment should contribute to the technologies' maturation. The DOE grants went to the outstanding names in ocean energy. It is likely the names on the DOE grant list will be the companies that will lead in the field. (1) Electric Power Research Institute, Inc, (EPRI) for fish-friendly hydropower turbine development & deployment. 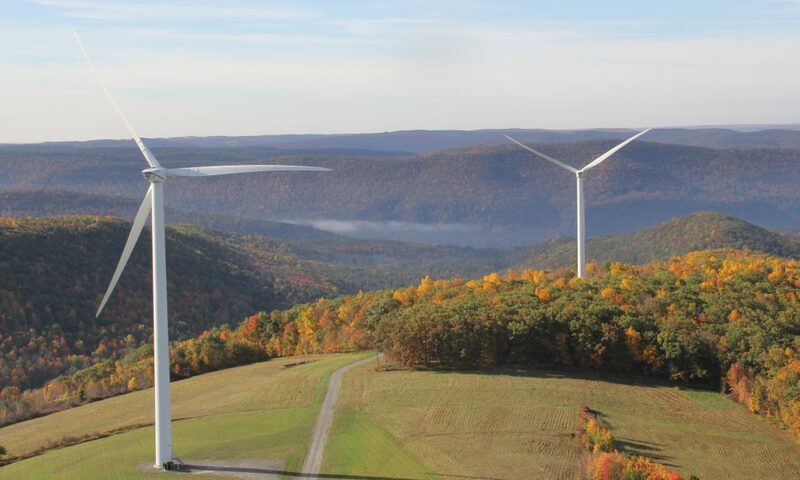 (2) Verdant Power Inc., for improved structure and fabrication of large, high-power kinetic hydropower systems rotors. (3) Public Utility District #1 of Snohomish County (SnoPUD), for a Puget Sound tidal energy in-water testing and development project. (4) Pacific Gas and Electric Company (PG&E) for in-water testing and development of the WaveConnect Wave Energy Project. 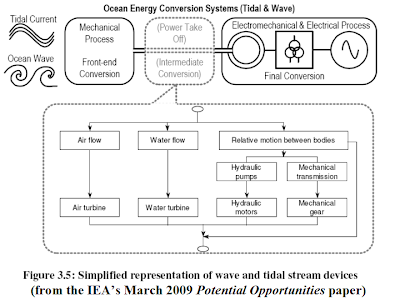 (5) Concepts ETI, Inc, for the development and demonstration of an Ocean Wave Converter (OWC) power system. (6) Lockheed Martin Corporation for an advanced composite Ocean Thermal Energy Conversion (OTEC) cold water pipe validation test project. (1) EPRI, for wave energy resource assessment and GIS database development for the U.S.
(2) Georgia Tech Research Corporation, for the assessment of energy production potential from tidal streams in the U.S.
(3) Re Vision Consulting, LLC, for the study of best siting practices for marine and hydrokinetic technologies with respect to environmental and navigational impacts. (4) Pacific Energy Ventures, LLC, for the writing of siting protocols for marine and hydrokinetic energy projects. (5) PCCI, Inc., for the identification of potential navigational impacts and mitigation measures of marine and hydrokinetic renewable energy technologies. (6) Science Applications International Corporation, for international standards development for marine and hydrokinetic renewable energy. (1) Oregon State University, and University of Washington - Northwest National Marine Renewable Energy Center, to further develop the Northwest National Marine Renewable Energy Center with a full range of capabilities to support wave and tidal energy development in the U.S.
(2) University of Hawaii National Renewable Marine Energy Center to further facilitate the development and implementation of commercial wave energy systems and to assist the private sector in moving ocean thermal energy conversion (OTEC) systems beyond proof-of-concept to pre-commercial long-term testing. 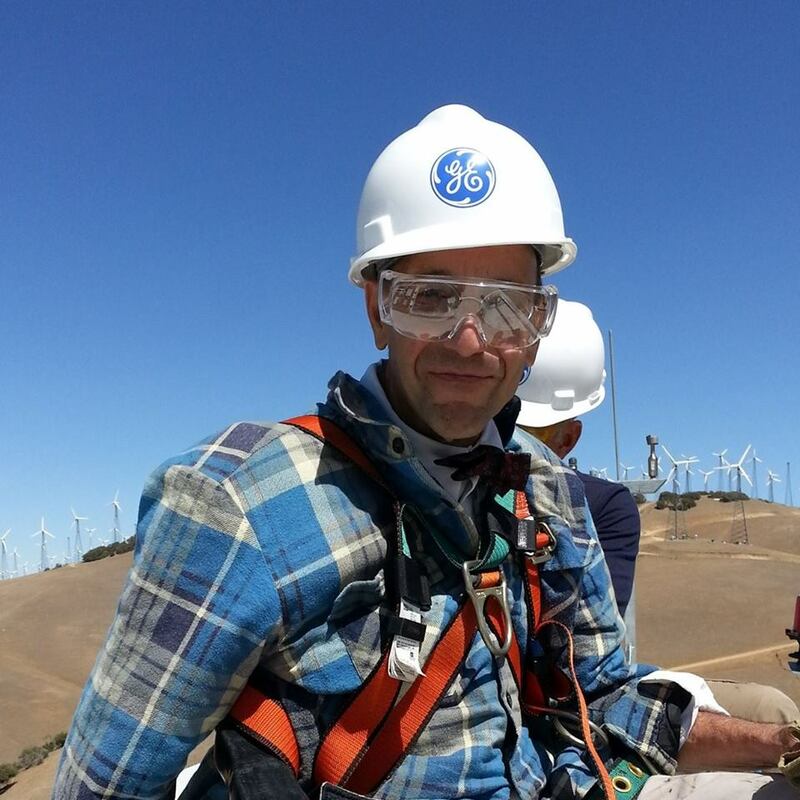 (1) Pacific Gas and Electric Company (PG&E). Its troubled Finavera Renewables AquaBouy 2.0 wave energy installation in Northern California could eventually be the first working U.S. project, perhaps in 2010. (2) Siemens AG. Voith Siemens Hydro Power Generation owns Wavegen, Scotland's first wave power company. 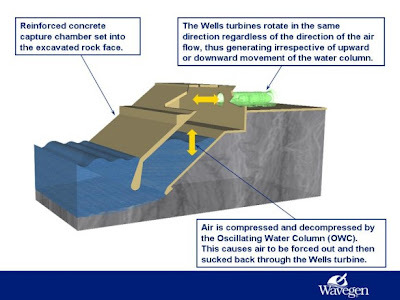 Wavegen is an oscillating water column (OWC) which, as a stable device near the shoreline, has to take less punishment from the harsh ocean environment. A small device is already connected to Scotland’s grid and they are planning another for Northern Spain. (3) Ocean Power Technologies, Inc. OPT's PowerBuoy is used to supply wave energy-generated electricity. Iberdrola is paying for a PowerBuoy station off Santona, Spain, is talking with French oil major Total about a project off the French coast and is developing plans for England, Scotland, Hawaii, and Oregon. 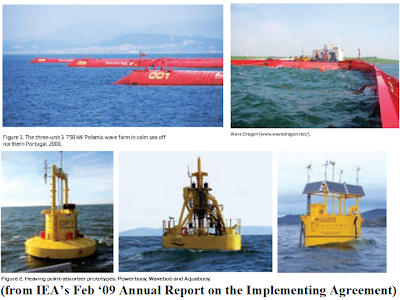 (4) Pelamis Wave Power, formerly known as Ocean Power Delivery. A groundbreaking Scottish technology, Pelamis has won funding from General Electric Energy and Norsk Hydro, among others, and is being watched by Chevron. Pelamis Wave Power may put Scotland at the forefront of Europe's New Energy sector. (5) Endesa SA ADS. Endesa is the Spanish electric utility that partnered with Pelamis, the world’s first full scale commercial wave power installation off Aguçadoura, Portugal. 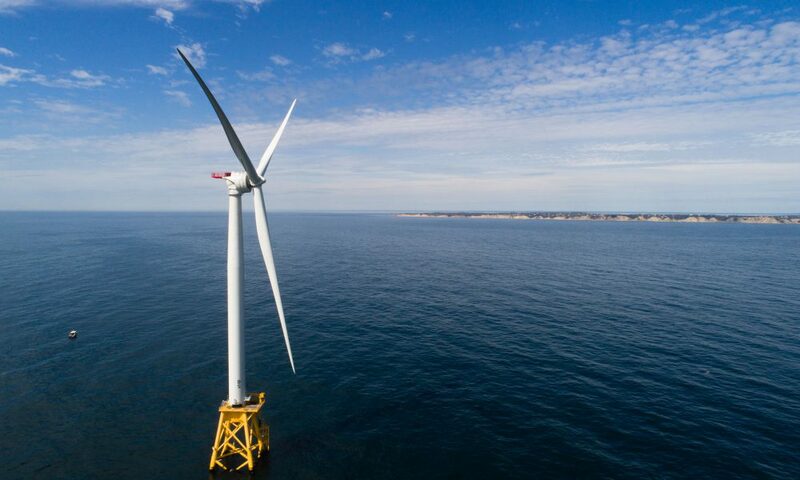 Though the first phase failed in the harsh ocean conditions and was towed ashore last fall, a second phase could be as big as 20+ megawatts and change the wave energy game. (6) RWE AG ADR. A German management holding company, RWE has 6 power and energy divisions and is developing wave power stations in Siadar Bay on the Isle of Lewis off the coast of Scotland. (7) Oceanlinx. Its oscillating wave column design has been funded by RWE and it is planning projects in Australia, the U.S., South Africa, Mexico, and Britain. (7) Alstom. In a sign of things to come, the multinational power and utility giant has begun developing wave and tidal projects. - Tidal technologies are on the verge of maturity. - River current energy pilot projects are proceeding successfully but ocean current pilot projects have been defeated by the elements. - Ocean Thermal Energy Conversion (OTEC) projects are purely experimental. - The potential of wave energy is impressive. 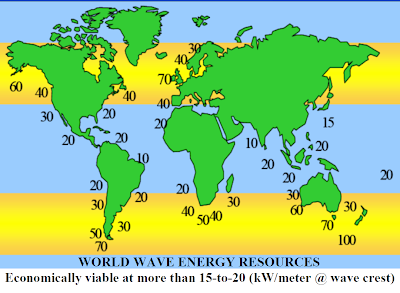 - There are potential wave energy development sites worldwide. 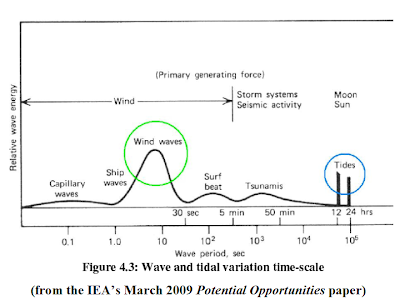 - Site selection will be one key for wave energy: (1) Enviromental impacts, thought to be benign, remain unsettled and will slow development. (2) The fishery industries must be accommodated. (3) Ocean recreation must be accommodated. (4) Shipping and Naval concerns must be addressed. - Cost competitiveness is in doubt and will remain in doubt until the technology matures. - To mature, ocean energy technology must prove sturdy enough to endure the intensely harsh ocean environment. - Environmental hardening must be done cost competitively and the technology maturation that is necessary for cost competitiveness has not been achieved. - Once built, operation and maintenance costs of adequately sturdy devices will be low and fuel will be – FREE. 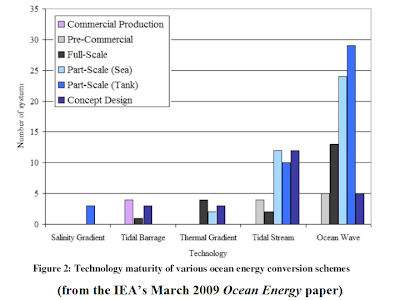 - Stated mission of the IEA-OES: “To facilitate and co-ordinate ocean energy research, development and demonstration through international co-operation and information exchange, leading to the deployment and commercialisation of sustainable, efficient, reliable, cost-competitive and environmentally sound ocean energy technologies. You can download and see videos of animations and scaled lab models in operation. If you interested in my JET blade design, please contact me.